While everyone can attend any of the days listed, it is usually advisable to have a couple of days break in between, hence the suggested Mon/Thu and Tue/Fri grouping, but if Mon/Fri and Tue/Thu works for you, that's no problem. Note: During school holidays, there are no classes at Newtown. However, Newtown North PS students may attend the Petersham classes free of charge during the school holidays. 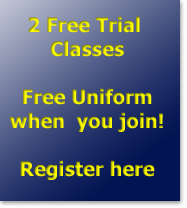 The Wednesday class is a general fitness/exercise/circuits class that is open to everyone. Currently enrolled students may participate free of charge, and anyone else will simply have to register as a member of the dojo and the IFKKA for $10, and each session is $20. The class consists of workout for about 45 minutes, after which we spend 30-45 minutes stretching.